Indirect Procurement with Synergy | SwainSmith, Inc.
SynergyTM Indirect Procurement is a complete program for MRO procurement. It provides a disciplined framework for purchasing MRO materials, negotiating contracts, managing vendors, and controlling costs. What Is SynergyTM Indirect Procurement? What’s Included in the SynergyTM Indirect Procurement System? Implement procurement best practices! SynergyTM includes industry-accepted policies for purchase order management, purchasing authority, emergency purchases, business conduct, and more. It gives you best practices for the whole procurement process, from buying to receiving to invoicing. Control spend with disciplined procurement processes! SynergyTM provides a complete set of processes for indirect procurement, including purchase requisitions and purchase orders (POs), requests for quotations (RFQs) and requests for proposals (RFPs), bid evaluation, contracting, vendor management, accounting coordination, and more. Save money by keeping better track of warranties! SynergyTM includes guidelines for establishing a warranty administration program, managing different types of warranties, and tracking warranties using your EAM software system. Establish clear roles and responsibilities for MRO procurement! SynergyTM includes a responsibility assignment matrix (RAM) for procurement, guidelines for delegating purchasing authority, and a set of role definitions for the MRO procurement team (Procurement Manager, Buyer, etc.). Improve procurement performance! SynergyTM details more than 20 of the most valuable reports for procurement, including daily information needs (such as purchase order management) as well as advanced cost and vendor reports. It also provides definitions, targets, and examples of more than a dozen key performance indicators (KPIs) for the procurement function. Every element of SynergyTM, from processes to codes to KPIs, is based on industry-accepted practices. SynergyTM is ISO compliant. It satisfies the requirements of ISO 55001, ISO 41001, PAS 55, ISO 14224, and other international standards for asset management. SynergyTM is built on SwainSmith’s 20 years of experience in maintenance and asset management consulting. We know what works. Easily customize any element to create your own documentation model that fits your organization’s specific circumstances. All documents are provided in Microsoft Word, Excel, or Visio file formats for easy editing. Templates are designed to work efficiently for organizations in various industries, with single or multiple locations, so only simple customization is required. Designed for beginners: Processes are written in simple language with easy-to-follow, step-by-step instructions for tasks and activities. Intuitive structure: Processes and procedures are organized in a logical sequence that follows the process flow of a typical maintenance operation. Templates have a consistent format that describes the who, what, when, where, why, and how of each process, procedure, and KPI. Simple, common-sense document numbering makes it easy to find the procedure you need. Built-in glossary defines key terms and abbreviations. Every SynergyTM subscription comes with complimentary training and support to help your team get the most out of the model. SynergyTM can be used with any CMMS or EAM software system. It provides the foundational practices and data that asset information systems need to succeed. Our customers include users of IBM Maximo, Infor EAM, Oracle eAM, SAP Enterprise Asset Management, and many of the industry’s other leading software systems. Optimize your indirect procurement operation with SynergyTM. 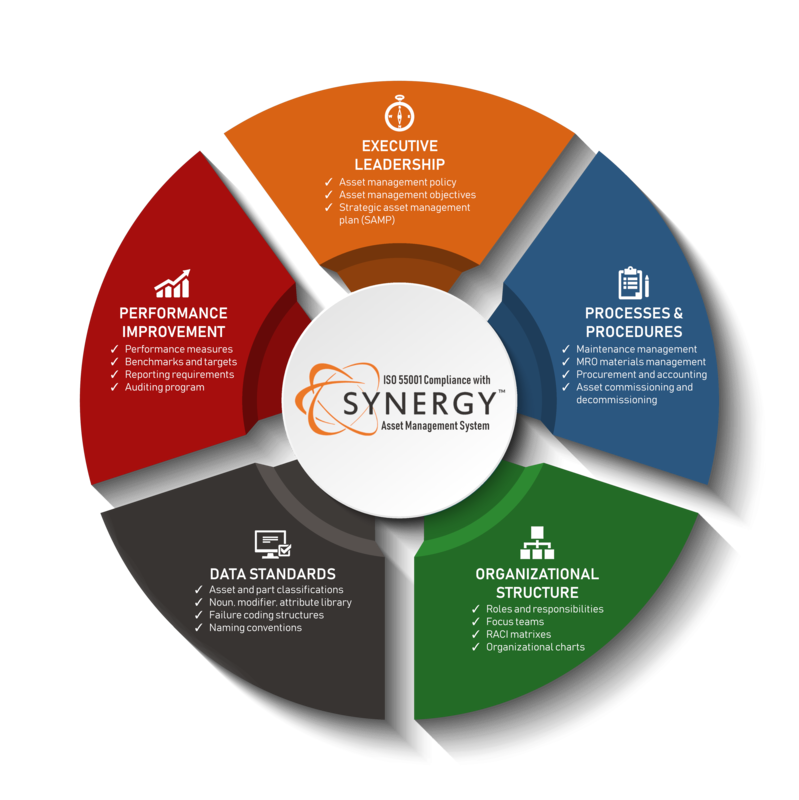 Contact SwainSmith today for a complimentary assessment of how SynergyTM can improve your EAM operation.